Space planning in a kitchen requires a significant amount of pre-planning. So many aspects have to be taken into consideration: work space layout, plumbing and appliances, countertops, safety, seating and storage. These guidelines have been provided by the National Kitchen and Bath Association. These guidelines were developed to help designers with good planning practices that consider the typical needs of users. 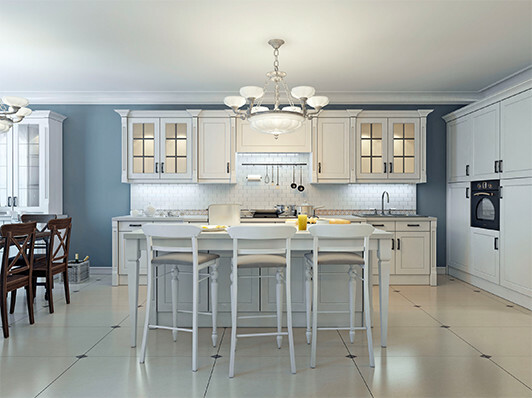 A committee of experts in kitchen design reviewed lifestyle and design trends and model building code requirements to assure the guidelines promote the health, safety and welfare of consumers. 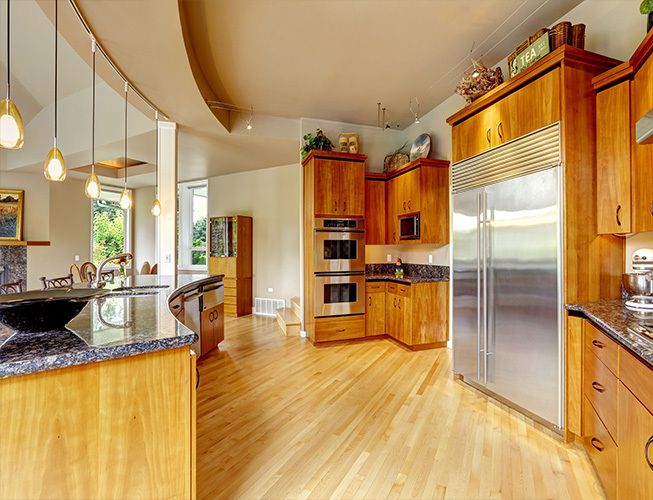 Before beginning the process, it is helpful to analyze what features have been successful in your past kitchens as well as what features were not successful. Often, identifying what doesn’t work can help pave the way for solutions that will be more efficient and successful in your next kitchen. 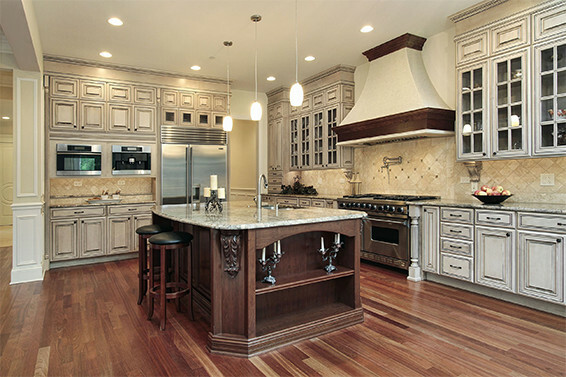 Consider hiring a kitchen designer or experienced cabinet specialist for this process. There are so many details that kitchen designers are trained to look for, they are sure to save you time, money and headaches from regretful decisions. In the kitchen, there are space considerations to keep in mind. For example, the distance between work centers. In a kitchen with three work centers the sum of the three traveled distances should be no more than 26’ with no single leg being more than 9’ or less than 4’. With additional work spaces, each additional travel distance to another area should measure no more than 9’ and no less than 4’. When separating work centers, a full height, full depth tall obstacle such as a refrigerator should not separate 2 primary work centers. It’s acceptable to properly recess a tall object in a corner, like a pantry cabinet. This advice is smart planning as well as great advice from an aesthetic standpoint. You’ve probably heard of the “kitchen triangle”. 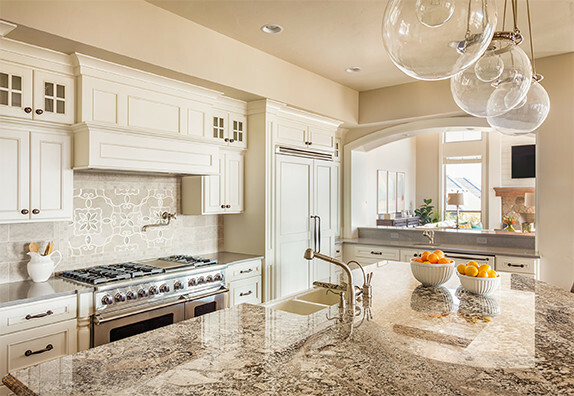 The NKBA defines the work triangle as an imaginary straight line drawn from the center of the sink, to the center of the cooktop, Once you have laid out your work centers, it’s time to place your plumbing and appliances.to the center of the refrigerator, and finally back to the sink. Some guidelines for that triangle include: No traffic patterns such as walkways or hallways should cross through the work triangle. This can be a busy place so considerations for people to get to other rooms needs to be made. For the work aisle, the width of the work aisle should be at least 42” for a single cooktop and 48” for multiple cooktops. Once you have laid out your work centers, it’s time to place your plumbing and appliances. If there is only 1 sink in the kitchen, place it adjacent or across from the cooking surface and the refrigerator. Beside the sink, allow 24” of space to one side of the sink and at least 18” on the other side to allow for clean up and sink prep. This doesn’t seem like it’s necessary until you imagine a sink full of dishes and no room to spread out, dry a dish or set a dish rack. If all of the countertop near the sink is not the same height because the sink area is recessed, then plan for 24” of width on one side and 3” on the other, both at the same height of the sink. It is recommended to have a section of non-interrupted countertop space at least 36” wide and 24” deep right next to the sink for preparation/work area. Auxiliary sink or prep sink – At least 3” of countertop should be on one side of the sink and 18” on the other, both at the same height of the sink. Secondary sinks are great if there is more than one cook in a household. It allows more to be done at one time! Include 12” of space on one side of the cooking surface and 15” on the other. If the cooking surface is recessed or raised, the 12” and 15” landing space must be at the same height as the cooking surface. For cooking surfaces in the island, the countertop should extend at least 9” behind the cooking surface of the countertop height is the same as the cooking appliance. You need 24” of space between the cooking surface and a protected non-combustible surface above it. Add 6 more inches if the surface above it is unprotected/combustible. For microwaves above a cooking surface, use the manufacturer’s recommended spacing. All cooking surface appliances need proper ventilation. Think about the height of the persons using the microwave when considering placement. The ideal location is for the bottom of the microwave to be 3” below the principal users shoulder, but no more than 54” above the floor. If the microwave is placed below the countertop, the oven bottom must be at least 15” off the finished floor. 15” of landing space needs to be either above or next to the oven. At least a 15” landing area that is not more than 4’ across from the oven is ok if the oven doesn’t open into a walkway. There needs to be ample room to set the hot item coming out of the oven down. The dishwasher needs to be within 36” of the closest edge of the nearest sink. Be sure to allow at least 21” of standing space between the edge of the countertop, cabinets or appliances and the front of the dishwasher that are placed at a right angle to the dishwasher. If you have a large family, consider using 2 dishwashers. Allow 15” of space on the handle side of the refrigerator, 15” of space on either side of a side by side refrigerator, 15” of space that is no more than 48” across from the front of the refrigerator or 15” of space above or adjacent to any under counter style refrigeration appliance. For safety purposes, do not locate a cooking surface under an operable window. Window treatments above a cooking surface should not be made from flammable material. 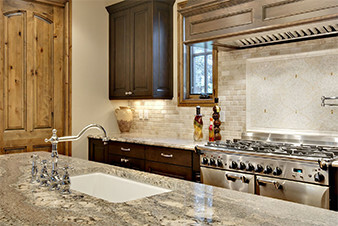 After planning your work centers and placing appliances, take into consideration your countertop space. A total of 158” x 24” deep is needed (with at least 15” of clearance above) to accommodate all kitchen uses, including landing area, preparation/work area and storage. Consider countertops with clipped or rounded corners because the edges are safer than sharp angled edges. There’s more to consider in the kitchen than cooking. Also to consider are the people that will be passing by as you cook and the people that will be sitting to enjoy the fruits of the kitchen labor. In a seating area where no traffic passes behind, allow 32” of clearance from the counter/table edge to a wall or other obstruction. If traffic does pass behind a seated diner, allow at least 36” for someone to edge past and allow at least 44” for someone to be able to walk past. For tables or counters that are 30” high, allow a 24” wide by 18” deep counter/table space for each seated diner and at least 15” of clear knee space. For tables or counters that are 36” high, allow a 24” wide by 15” deep counter/table space for each seated diner and at least 15” of clear knee space. For tables or counters that are 42” high, allow a 24” wide by 12” deep counter/table space for each seated diner and at least 12” of clear knee space. There never seems to be enough storage for all of the latest kitchen gadgets and tools, but at a minimum, you need 1400” or 116’8” of total shelf/drawer frontage for a small kitchen that measures less than 150 SF. You need 1700” or 141’8” for a medium sized kitchen that measures 151 to 350 sf and 2000” or 166’8” for a large kitchen that is greater than 350 SF. If your kitchen has a corner, at least one corner cabinet should contain functional storage, such as a lazy-susan. With today’s focus on green and increased waste for families, consider including 2 waste receptacles. Both can be for waste or one can serve as a recycling station. One is best located near the sink/prep area. The second can be right beside the primary or in another location in the kitchen that is convenient for you. Lastly, check your local building code for placement and quantity of electrical receptacles. Code requires that GFCI (Ground- fault circuit-interrupters) protection is required on all receptacles servicing countertop surfaces within the kitchen. Also, check your code requirements for lighting. Every work surface should be well illuminated by appropriate task lighting and at least one wall switch controlled light must be provided. Keeping these guidelines in mind when planning your kitchen will ensure you have a safe, healthy and productive working environment. These are guidelines, so if you are an experienced cook and have traits and habits that modify these guidelines, remember your kitchen is designed to work best for you and your lifestyle.